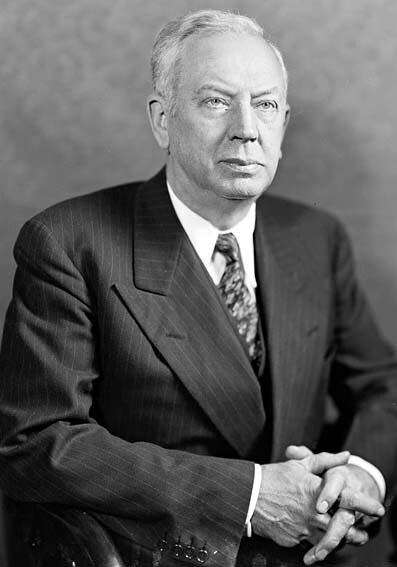 Edward Martin (September 18, 1879 – March 19, 1967) was an American lawyer and Republican party politician from Waynesburg, Pennsylvania. Martin served as a Major General in the Pennsylvania National Guard. He served as the 14th commander the 28th Infantry Division from June 1939 until January 1942 and later retired from military service and went on to serve as the 34th Governor of Pennsylvania (January 20, 1943 – January 3, 1947) and then United States Senator (January 3, 1947 - January 3, 1959). Martin was prominent in the development of Fort Indiantown Gap and after his death, the United States Senate renamed the facility the Edward Martin Military Reservation, a designation that Martin himself had rejected throughout his life. The new name was never fully accepted by the military personnel who served there. In 1975, the Secretary of the Army renamed the post Fort Indiantown Gap in order to more closely align it with the other Active Duty stations throughout the United States. The Joint Force Headquarters of the Pennsylvania National Guard is located at Fort Indiantown Gap, and is named Edward Martin Hall in Martin's honor. The Library at the National Guard Association of the United States (NGAUS) is dedicated to Martin and is named the Edward Martin Memorial Library. While not a circulating library, it serves as one of the foremost collections of National Guard documents and is ideal for researchers. Original volumes include a complete collection of NGAUS Conference minutes dating to 1879 and Adjutant General (TAG) Reports dating to the early 20th Century. He died in Washington, Pennsylvania, in 1967 and is buried at Greene Mount Cemetery in Waynesburg.